The film Katyn portrays the events of the Spring of 1940 when Soviet NKVD forces murdered 15,000 Polish officer prisoners of war. They were killed in the Katyn forest, Tver and Kharkiv and buried in mass graves. The German army, after their attack on the Soviet Union, discovered the graves in April 1943. The Soviet Union denied all responsibility even although Stalin himself had ordered the execution of the Polish officers. It was not until 1990 that the Soviet Union finally admitted their culpability for this atrocity. View the trailer for the film Katyn. 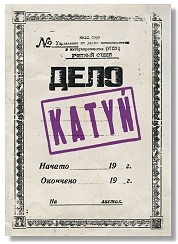 The following Katyn DVD and book have been published. Film Released - Film released in Poland in October 2007. DVD - DVD released in UK in October 2009. Running time of 115 minutes. Language Polish. Subtitles English. An accompanying book, available in both English and Polish, which tells the story of the film Katyn has also been published. Publisher - Published in 2008. Commentary by Andrzej Wajda and his film crew is accompanied by stills from throughout the film. The chronology of the Katyn crime and the lies surrounding it as well as the numerous historical photographs from Andrzej Wajda's personal archive are valuable resources regarding this event. This book is especially compelling in its presentation of the objects that were discovered during the exhumations of the Polish officers. It's a pretty good film by any reasonable standard - it's intelligent, thoroughly engrossing, technically assured, makes its numerous points through well-staged drama instead of soapbox oratory, begins and ends with two brilliantly-conceived set-pieces...The most avowedly Polish of filmmakers, Wajda has unapologetically targeted his film squarely at his fellow countrymen, and if international viewers are to appreciate it on the same level, it's up to them to do the necessary homework if they're not to feel like an outsider at a close family funeral. Katyn...tells the story of the near-simultaneous Soviet and German invasions of Poland in September 1939, and the Red Army's subsequent capture, imprisonment, and murder of some 20,000 Polish officers in the forests near the Russian village of Katyn and elsewhere, among them Wajda's father. The justification for the murder was straightforward. These were Poland's best-educated and most patriotic soldiers...They were the intellectual elite who could obstruct the Soviet Union's plans to absorb and "Sovietize" Poland's eastern territories. On the advice of his secret police chief, Lavrenty Beria, Stalin ordered them executed. This page was added on 15 April 2008. Updated on 22 January 2012.